Samsung's flagship model is a technological tour de force. If you like your mobile phones mould-breaking, you’ll go some way to beat the Samsung S7 Edge 32 GB. The striking edges from which it draws its name offer the first sign that this elegant handset has something of the extraordinary about it. The stylishly curved glass wraps around the sides of the phone to give an innovative, modern mobile that nestles neatly in the palm of your hand. Plus, there’s more to those lovely glass edges than meets the eye, housing as they do several nifty features. 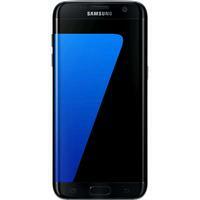 The Samsung S7 Edge is a true flagship model aimed at those for whom only the very best and the very latest in technology will do. And it stands ahead of the crowd in a number of areas; from the superb camera, the strong battery, the cutting-edge design, to the muscular processor. It’s not cheap, in fact it’s significantly more expensive than many rival handsets, but UK reviewers consistently agree that the Samsung S7 Edge 32 GB is worth every penny. The distinctive display features a sharp 5.5-inch screen packed with interesting functions. You can park extra menu items on the phone’s edge, from app shortcuts to contacts, while the curvature lets you see the time from the comfort of your bed while the phone rests on the bedside table. Users of the Samsung Galaxy series will be familiar with Samsung’s commitment to packing their phones with extra features. The S7 Edge is no different, boasting a fingerprint scanner and heart rate monitor amongst other bonus features. The phone is a definite improvement on its already impressive predecessor, the S6 Edge. Not only can you now upgrade the handset’s 32 GB memory with an SD card (not included), the S7 Edge is completely dust and water-resistant – you can even take it in the shower with you! One of the highlights of this excellent piece of kit is the exceptional camera. The Samsung S7 Edge has the same 12 MP camera as its "non-edge" cousin the S7 (which is actually less than the S6's 16 MP). However, a great camera is measured by more than its MP capability, and this is where the S7 Edge comes into its own. For example, the upgraded camera has improved light sensitivity, making it easier to record video and take pictures in low light. The video functionality allows you to shoot video in 4K at 32 FPS (frames per second), and it can also shoot slow motion at 240 FPS at 720p, giving it an almost “broadcast” quality. Finally, the Samsung S7 Edge 32 GB can be charged by wire or wirelessly (with a separately purchased Wireless Charging Pad), making this a phone that truly embodies the concept of “mobile”. Samsung's ground-breaking flagship model is a stunning piece of kit and an absolute joy to use.